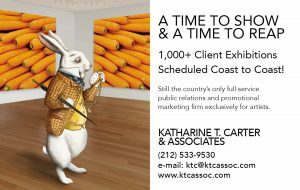 Reviews of recent art shows and exhibitions. Confluence is an unassuming yet poignant and sincere exhibition featuring Keith Kattner with seven American and Korean artists that are working in parallel only to converge at this moment of exhibition. The exhibit joins together a variety of cultures, memories and traditions with innovation to address underlying personal, artistic and world view concerns. 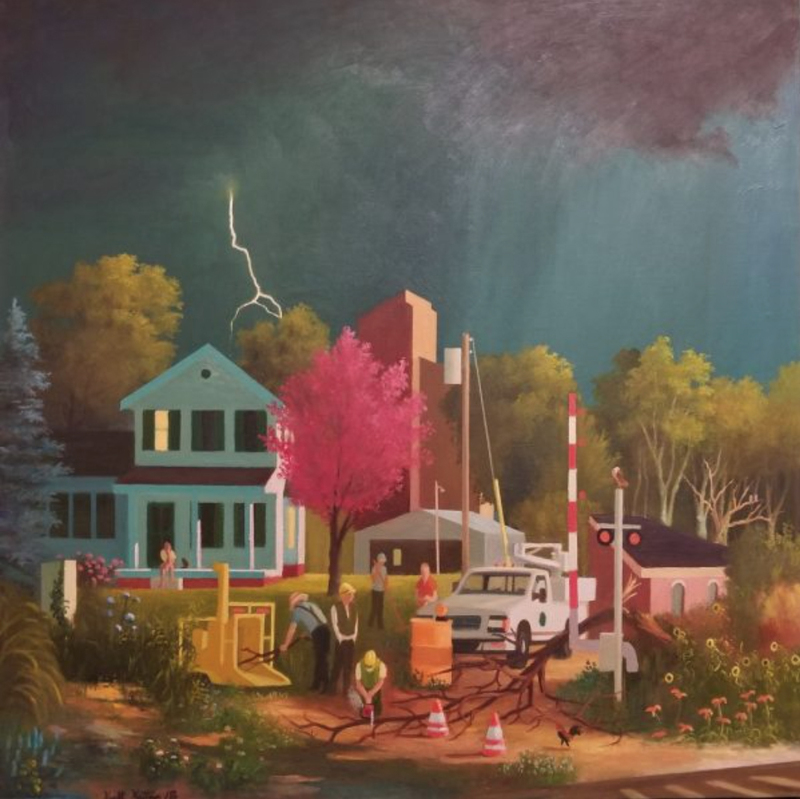 Kattner’s fourteen paintings are the heightened convergence of the exhibit with seemingly subdued scenes that in fact are energetic interventions of art references, modern life versus an idealized “good old days”, and pastoral mingling with urban. All coming together in Kattner’s structural theme of entropy with its uneasy transfer of imagery in equal measure of disorder and diversity/destruction and creation. 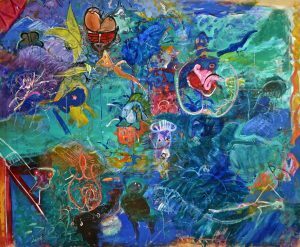 Kattner creates a pictorial leveling off of all differences within the painting while falling into a more complex and highly ordered system. In Kattner’s Thor and the Little Red Rooster, the background is typical Hudson River School trees, a threatening sky and a bolt of lightning, but with a monolithic modern building directly in the painting’s center. Off to the left there is an all-American Hooper-esque house where a woman(?) and cat are on the porch. While in the foreground a municipal work crew at a train crossing is removing a downed tree, complete with chainsaw, truck, safety cones, tree chopper and a few guys standing around. And the little red rooster, well he’s right up front. Throughout history artists have painted the four seasons and Kattner’s The Four Seasons are sublime kitsch. Spring is a bucolic scene of people enjoying the day by a body of water nearby stands a group of farmhouses with some type of modern looking metal contraption. A luxurious day by a body of water is captured in Summer with thick black/reddish smoke billowing from stacks. Fall is a depiction of a crisp day by a body of water where people gather pumpkins, bundle the harvest and skin an animal while jutting into the sky is a metal tower with a light on top; possibly a cell tower. 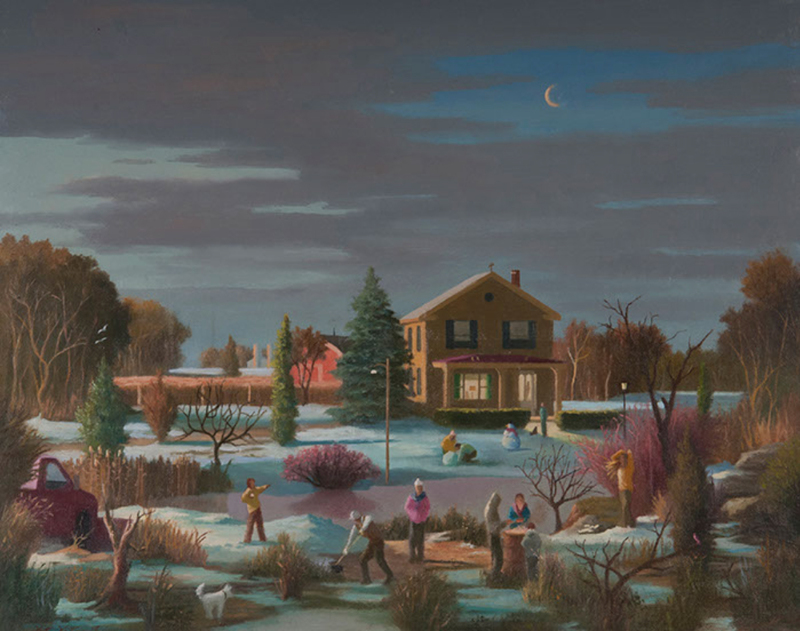 The trees are bare and the ground covered by snow in Winter as people by a body of water build a snowman, huddle by a fire, play on the ice and there is a warm glow coming from a home with someone’s red pick-up just protruding into the left of the painting. 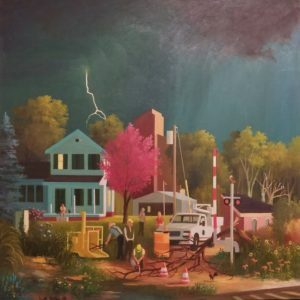 The little red rooster is equal to the god Thor’s lightening bolt, an almost identical body of water in each painting, people with no discernable faces, the colors and lighting have a similar tonality and quality throughout all fourteen paintings. The sense of randomness and order in near uniform extent affects every inch of Kattner’s canvases, as well as our seeing and comprehension of the paintings. The totem-like sculptures by Hoo Chang Lee are reflections of light representing the illusory nature of visual experience. Raphaele Shirley’s large photographs from her Artic Lights series documents a light environment where one’s understanding changes depending on the viewer’s position in relation to the work. Yong R. Kwon’s “paintings” are not seen until the lights come on when hundreds of handmade stainless-steel discs reflect and disperse the light. 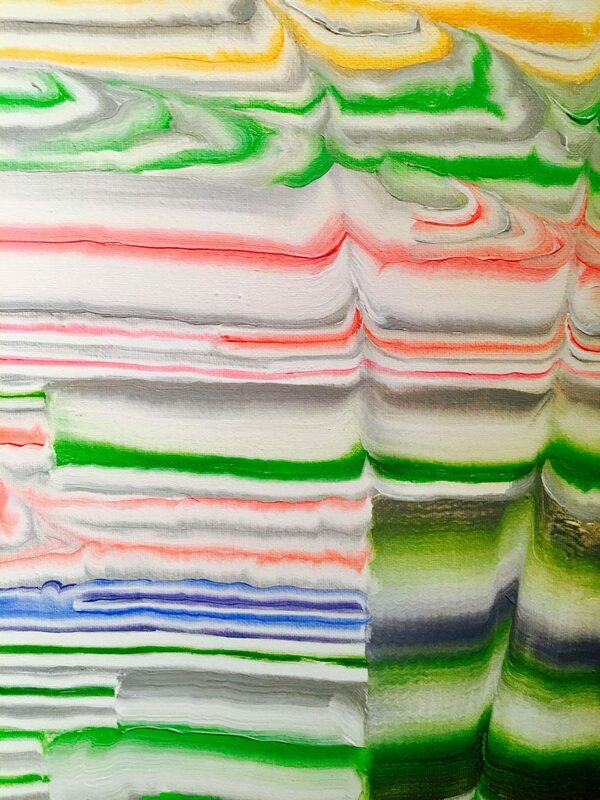 The bundled metal shells arrayed in Kyung Youl Yoon’s Cubic Inceptions paintings are metaphors for today’s concerns whether it is global climate change or materialistic goods. Likewise, Chuck Davidson’s discarded pieces of urban life are reassembled constructions reflecting our own contrasting relationships. 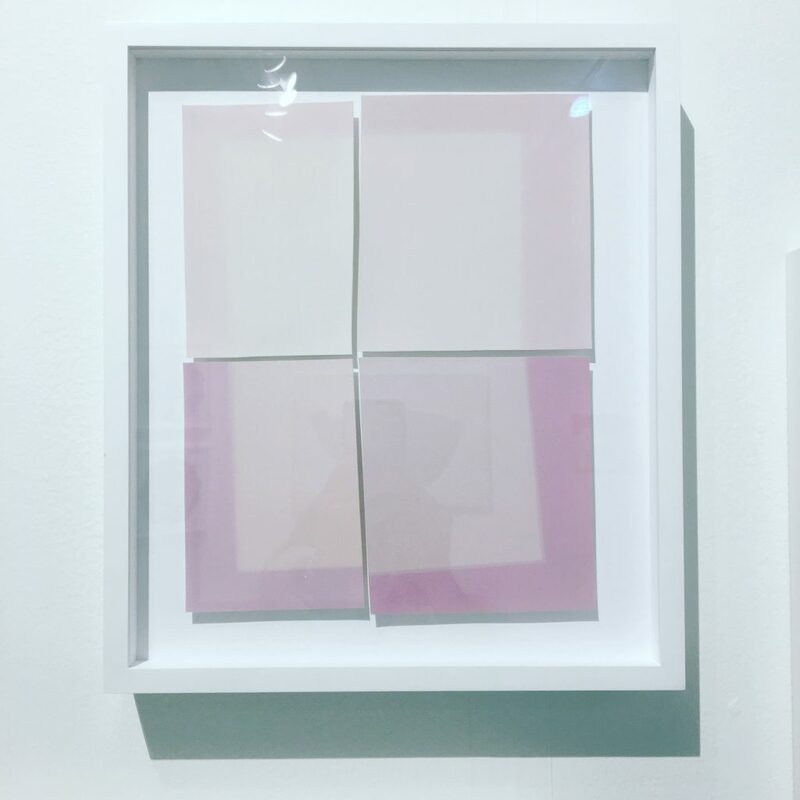 Gwang Hee Jeong and Ham Sup begin by transforming hanji, traditional Korean handmade paper, from its original state by re-assembling the paper into a heavily textured support for their paintings. Ham collectively brings an East-West synthesis into his abstraction, while Jeong’s practice brings traditional calligraphy in concert with abstraction into one telling moment. With three exhibitions opening at the Hammond Museum, the big surprise is the work of Sam Bartman. Born in Brooklyn, NY in 1922, Bartman has spent the last 60 years of his life creating stirring paintings that combine some of the most the incompatible materials. In experimenting with what he calls his “special sauce”, Bartman has somehow tamed a mix of resins, varnishes, motor oil, glitter and automotive paints with oils and acrylics that results in everything from endlessly crackling surfaces and minute swirling storms of color. There are even the occasional brushstrokes that push the variously drying materials around leaving fossil like impressions of battered brush hairs sorrowfully spent in a furious wake of swished paint. Bartman is an outsider. 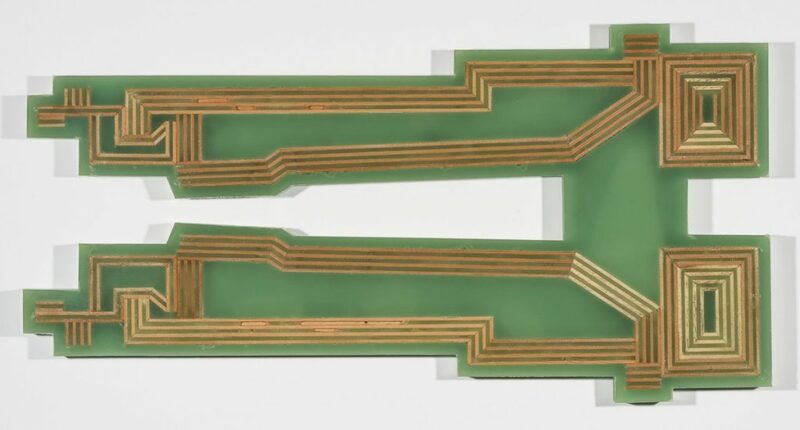 His unconventional and periled approach to previously incompatible materials could only have come from a place of pure, unrestrained, fearless experimentation common to this type. He scrapes, he pours, he projects his insights and instincts directly onto strange repurposed square surfaces comprised of millions of tiny glass beads attached to a sour yellow ground. In some instances, it all comes together looking somewhere between the more vigorous works of Vincent van Gogh and the paintings by Max Ernst that feature his decalcomania or grattage technique. 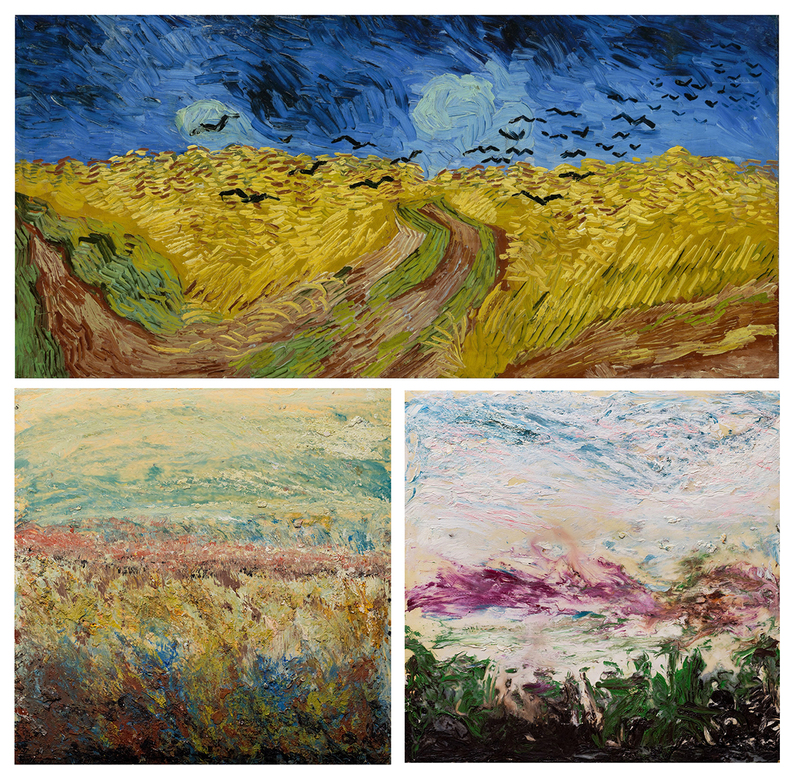 In reference to, or perhaps in his channeling of Van Gogh, you can see in Untitled (2008) and in First Attempt (1998) a similar heaviness and deliberateness in the paint application between the two artists. Comparatively, where Van Gogh is painting highly expressive and intensely colorful works en plein air; Bartman paints at night, indoors, using artificial light and in the solitude of his basement on a commandeered Ping-Pong table. Surrounded by the wafting waves of fumes and off gases his techniques produce, Bartman pulls from his daily observations filtered through a subconscious that allows all and any twist or turn. 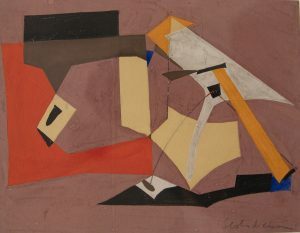 With Ernst, when you look at the techniques he used to create Painting For Young People (1943) you see decalcomania, a transfer of paint onto the surface on the large panel in the upper portion of this multi-segmented work; and grattage, a scraping away of material in the large panel on the bottom. You see similar look in A New World (n.d.) by Bartman, only in Bartman’s painting the resulting appearance of the top, where you have the organic swirls of color, is more the result of a chemical reaction relative to the incompatibility of materials used, than it is the chance blending of a somewhat blind transference of medium. And with both artists, there is the addition of facial features to personify the humanoid forms that inhabit these paintings giving some the impression of a lost soul in a threatening space. Overall, and despite the similarities to artists that have come before him, the art of Bartman is striking and powerful and worth much more attention than he has garnered to date. In the same room of the Bartman paintings you will find the mood-laden paintings of Laura Von Rosk. Her landscapes are also rather intimately sized, as her intended visions look like they might reside in a cleverly crafted storybook, albethey dark at times, as her representations often beg narration. In the front room as you first enter the museum is a circular space with six built-in vitrines. Each one of the display cases hold large sheets of paper filled with delicately drawn, subtly abstracted shapes that are clearly informed by nature. In each instance, Randy Orzano offers us his collaboration between himself and the bees he keeps. 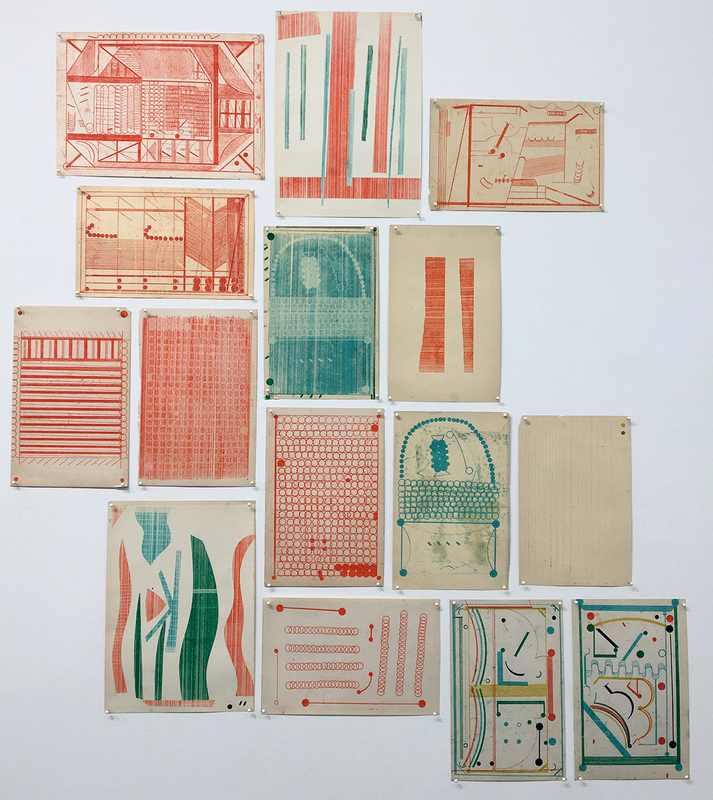 By placing his completed drawings flat or folded into the very beehives he tends to, Orzano gathers the residue of an orderly and purposeful social network. As the busy inhabitants eat away at and add wax and propolis to the hive and the bordering artist’s paper a new curious design takes shape that enhances the works on paper, while maintaining an indelible link between the artist and the industrious engineers. Featured in the large main room of the museum is an exhibition titled Arirang Grace – Between Dislocation and Settlement. All of the 16 artists in this exhibition are Korean and all are quite different in their use of materials and intended message. The loan North Korean Artist is easy to spot. Kun Hak Ri’s Rope Skipping (2003) shows a group of five children jumping with joy above a flower laden rope painted in a style that is both ideal in its representations and over-the-top in its positivity. 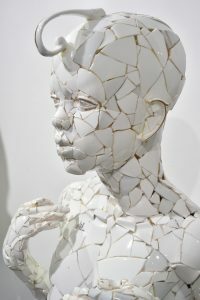 Bong Jung Kim, one accomplished artist whose work I have come to know quite well, offers a new series of figurative works constructed of fragments common to our fast-paced, ‘everything-is-quickly-outdated’ conditioning. In his longtime quest to project his addictions and obsessions, Kim bares his soul each and every time he makes his art. Additionally, he is showing us that the vast and endless amount of materials that is largely and quickly considered to be junk, can be seen as a treasure trove of inspiration in the hands of an artist. Myong Hi Kim’s Tea (2004) is a curious piece whereby the artist uses the recently abandoned school chalkboards she finds in rural South Korean towns that have lost students to the migration to cities. Working with oil pastels and chalk, and with the addition of a video of the foliage of the countryside, Kim art speaks volumes about the disappearing traditions of a simpler, more peaceful and rewarding life that is being erased by the promises of the modern era. Conversely, her husband Tchah Sup Kim opens and splays his paper coffee cup every morning in a shape reminiscent of a traditional folding fan and proceeds to paint or draw on them in various ways and in styles suggestive of his inspirations and interests. Both artists blend era and tradition in fascinating ways and both present the ages old discussion that pits the perils of progress against the tried and true qualities of life. All three exhibitions end November 10th. There are also sculptures in various media displayed throughout the grounds of the museum by a number of artists including Joy Brown, Mimi Czajka Graminski and Tom Holmes. Thanks to the hard work of individuals like Curator Bibiana Huang Matheis, Director Lorraine Laken and a dedicated board led by its President Evelyn Tapani-Rosenthal, the Hammond Museum & Japanese Stroll Garden has maintained its pivotal position in the arts and culture of Westchester County for over 60 years. Magnetic Fields: Expanding American Abstraction, 1960s to Today, which celebrates “the contributions of black women in the field of abstract art”, is a wonderful and stunning exhibition that features many powerful examples of Abstract Art. Walking through the exhibition, I am immediately struck by both the diversity and depth of the selections and the overall scale of the exhibition. Having seen the work of Chakaia Booker many times before, I am very happy to see and experience her work again, especially in this context. El Gato (2001), a rubber tire and wood sculpture that is totally textural and profoundly present, simultaneously challenges and captivates the viewer with waves of wild shapes and fluid gestures. On the opposite end of the exhibition stands another fascinating sculpture by Shinique Smith. Bale Variant No. 0012 (2015) combines a number of fabrics and materials forming a column-like bale of moments and memories. Clustered and tied in the shape of a tall square column, it immediately becomes a monument to diversity, while the recent images of displaced peoples, especially in Syria may make one think of homelessness and flight. When looking at this work I also think of the old cars and station wagons I have seen over the past few decades packed solid with endless belongings that house marginalized families and individuals who have lost their homes. So we have a message in “Bale Variant No. 0012” that can be both a celebration and a warning, depending on where the viewer’s mind and thoughts happen to be. Mildred Thompson offers Untitled (Wood Picture) (1966), a simple, but elegant work of art that subtly guides the viewer’s attention in and upward as the quietly shifting shapes glide through our awareness. A large painting by Thompson, Magnetic Fields (1991), shows her innate ability to mix very complex thoughts and theories with elusive and intuitive gestures. 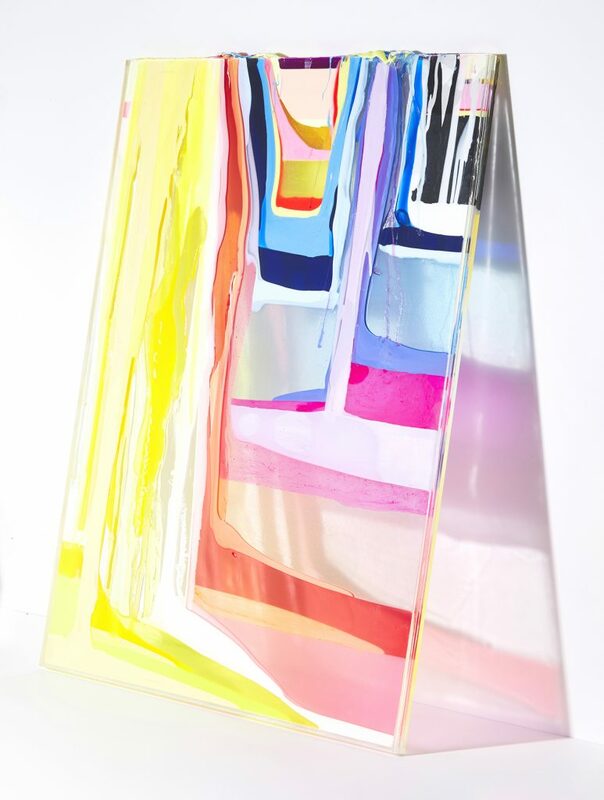 Nanette Carter’s Cantilevered #14 (2014), which is comprised of collaged bits of oil on Mylar, has a distinctive structure that suggests a battle between a ‘living’ geology and an uninspired architect’s desire to command nature results this work’s feeling of turmoil. On the other hand, the shifting patterns created by the brushed lines, which easily achieved on the slippery Mylar surface, have a sort of Jazzy-Cubist feel. Abigail Deville’s Harlem Flag (2014) is a miraculous medley of many media including sheetrock, a door and an American flag that speaks volumes about the history of Harlem and New York City in general – a place that has gone through many intolerable times and tragic moments. I can imagine that some will have a tough time getting passed the flag being used in this way, but it does symbolize, in this instance, the degradation and abuses of a people that will forever mark our history and unfortunately reflect our present and future. Deborah Dancy’s two mixed works on paper from 2015, Winter Into Spring 2 and Winter Into Spring 4 are meant to express the changing seasons from a cold colorless winter to the hopeful hues of spring. My initial reaction and perhaps what I am leaving here with is more of a coming out, a release from the dark shadowy boundaries one might crawl out from under whether they are physical, emotional or mental constraints. Howardena Pindell’s mixed media on canvas Autobiography: Japan (Shisen-Do, Kyoto) (1982) features multicolored hole-punched paper to create its curious tactile quality, while post cards and exhibition invitations imbedded here and there are actually a way for the artist to replenish her memory loss. Not knowing this at first, I saw the work as very organic, playful even, while the composition and shape suggests the centrifugal forces that result from a spinning motion. I also see a contrast in the surface, which is something like freshly mixed concrete with a course aggregate, with the collage elements sinking in. Perhaps my reaction is not all that far from the artist’s intent, as her memory is literally disappearing. 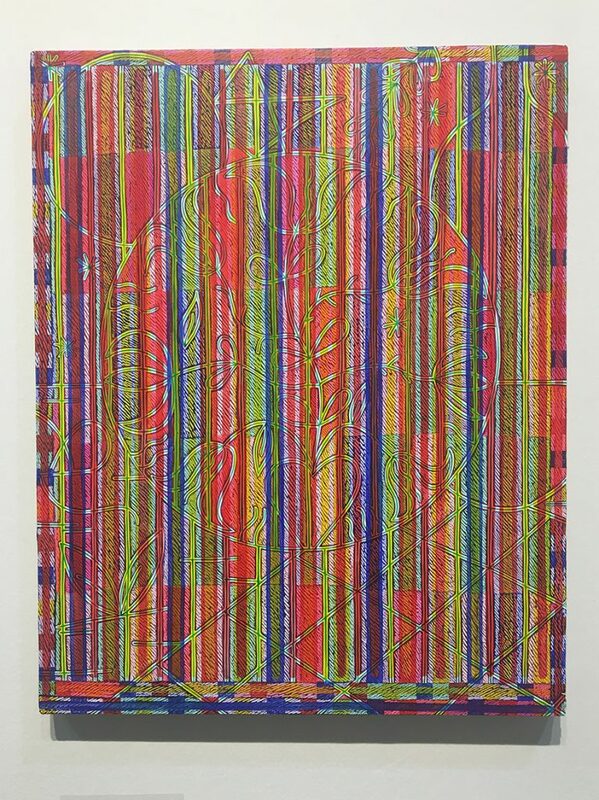 The title of Brenna Youngblood’s mixed media painting Yardguard (2015) is an obvious reference to the painted chain-link fence that corrals the composition. What ends up happening here is the dabs of paint, probably a water-soluble paint that are sprayed or splashed with water, spread, run and stain the surface. The resulting dreaminess, albeit highly abstracted, reminds me of Odilon Redon, giving this piece its surreal undertones – an unusual composition to be sure, but a very effective one. The oil on canvas titled Solitude (1963) by Mavis Pusey also has a jazzy aspect. The canvas, which looks more like jute or burlap, probably looks that way because the artist did an umber paint rub, probably thinned with stand oil, into the texture of the coarse canvas. This is important as the red and brownish black that is applied in distinct, razor sharp shapes seem to float above the surface by contrast. 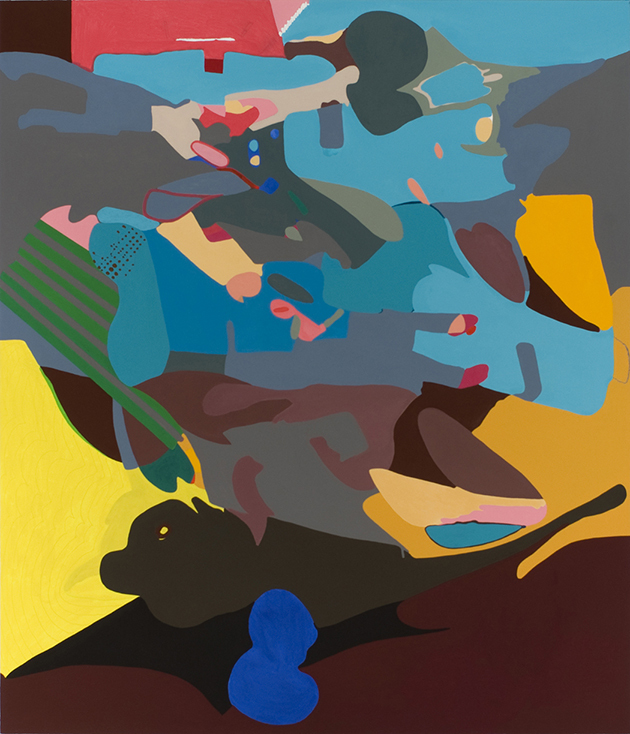 Candida Alvarez offers an acrylic on canvas titled black cherry pit (2009) that is quite Popish in its abstraction, with its very fluid and active composition. Overall, there is a distinctive push/pull here, a clashing of worlds – or should I say a coalescing of worlds – dominated by an overall positive atmosphere disrupted with a few curious twists and turns. 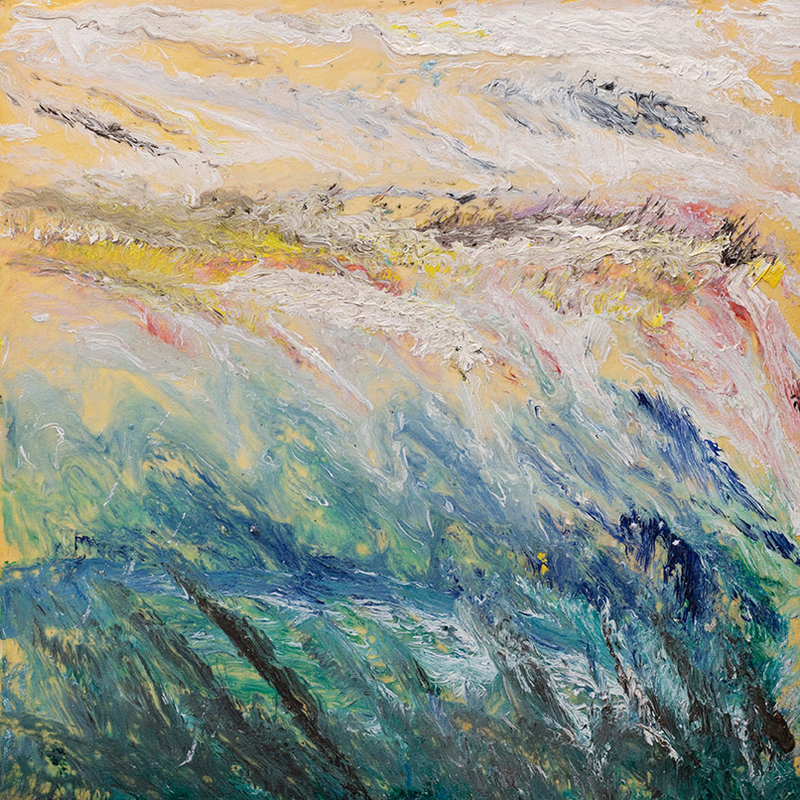 Sylvia Snowden’s June 12 (1992) has a soupy, frothy mix of paint swirls and pours that culminate in a fiery mix that almost totally obscures the background. 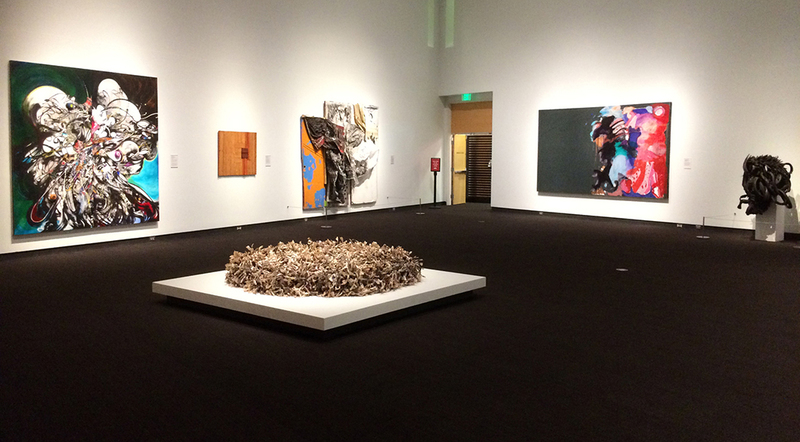 The acrylic, which is heavy and many layers thick, shines under the museum lights adding to its rich surface texture. 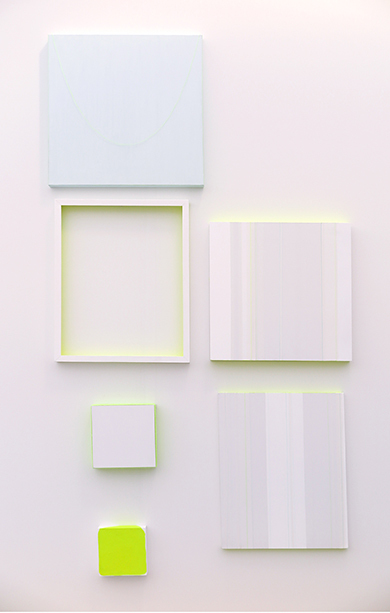 Jennie C. Jones has three Minimalist type works. The sound absorbing panels used in the assembling of this work to the artist, speaks of: “long unacknowledged contributions of African American musicians and jazz music to the broader American popular culture.” Not knowing this before I read the wall text – I see more of a sense of meditation – the freeing voids experienced and a subtle but sure tactile awareness one might sense when one’s thoughts are clear and a truer reality or presence of mind emerges. Betty Blayton’s Consume 12 (1969) is an oil painting on paper mounted on canvas that projects veils of thought or consciousness. The circular shape of the canvas, a tondo, gives this work a more dream-like orientation, while the way in which the artist works, applying shards of paper loosely across the surface, then painting over them with additional thin washes, has a most alluring and mysterious narrative. 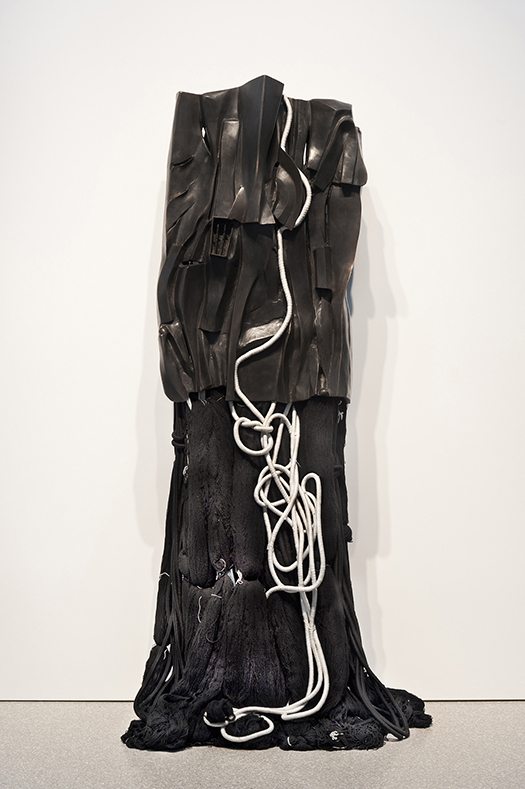 Barbara Chase-Riboud’s Malcom X #13 (2008) is meant as a monument to a “transformative individual” in Malcom X. In this tall bronze abstraction we see a soul embellished with silk, wool, linen and synthetic rope – a commanding, albeit twisting form that stands firm against all foes. There are many symbols here, some obvious, others obscure, but the overall feel is a figure that is monk-like in its beliefs and steadfast in its convictions. Kianja Strobert’s Charmer (2016) is something like an otherworldly Lee Bontecou from the 1950s or 60s’, while “Racism is Like Rain, Either it’s Raining or it’s Gathering Somewhere”, a mixed media painting by Mary Lovelace O’Neal, has a distinct and ominous storm brewing against a shroud of darkness. Here, the looming giant forms on the right are menacing mangled masses all twisted and in turmoil in mind and body. Maren Hassinger’s Wrenching News (2008), which is comprised of a number of gathered, rolled or coiled newspaper pages that featured information about the days following post Katrina, sits on a low, round platform. Here, we see the frustration of many across our land who could only watch in horror as the poor and disenfranchised of the New Orleans area were all too slowly rescued in a painful play of reality – a reality most of us will never forget. 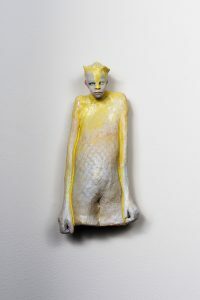 Lilian Thomas Burwell’s mysterious Winged Autumn (2007), a wall mounted sculpture or relief that has obvious references to flight or buoyancy offers a sense of hope, while Evangeline “EJ” Montgomery’s two offset lithographs have very fluid all-over compositions that are quite mesmerizing. Alma Woodsey Thomas, who is “a pioneer in abstraction and the elder in this exhibition” has in Orion (1973) a freedom of form and space that reminds me of the earth’s rotation seen when photographing night sky stars in long exposures. By painting the ‘night sky’ red with what looks like stately tree trunks reflected in calm water, Woodsey Thomas brings multiple worlds and dimensions together in one profound work. 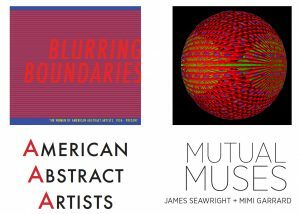 Magnetic Fields: Expanding American Abstraction, 1960s to Today, an exhibition that originated at the Kemper Museum of Contemporary Art in Kansas City Missouri, ends August 5th. M. C. Escher (1898-1972) has been a favorite of mine since the 1960s when that decade’s psychedelic, counter-culture mindset saw common ground in his transformative work. Escher’s art made it possible for all of us to see the impossible, to experience dimensions of space and time that were previously unimaginable. He combined math, architecture and science with a unique aesthetic in viewing the world around him, as it all coalesced in his brilliant mind resulting in the creation of a good number of incredibly iconic images. I was lucky enough to have visited galleries in SoHo as a young man in the early to mid 1970s when the Vorpal Gallery on West Broadway held a handful of Escher exhibitions. 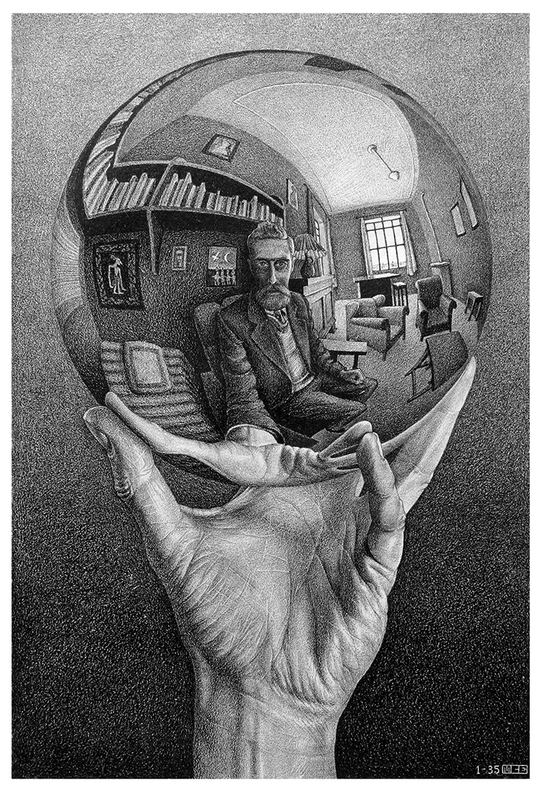 Just beginning my journey as a fine artist, I was fortunate to have seen his brilliance at a time when I had such a great need for seeing anything and everything profoundly intriguing, wildly enlightening and fully thought provoking and Escher’s art fit those categories perfectly. So here I am, almost 45 years later in an adjacent borough in Industry City Brooklyn, where I find myself at the press preview of Escher: The Exhibition & Experience thanks to my correspondence with fellow art industry professional, Loredana Amenta. The exhibition, which winds through a number of adjoining rooms is beautifully installed and perfectly lit to maximize the experience of seeing such a vast array of the master’s work. Curators Mark Veldhuysen and Federico Giudiceandrea, working with Italy’s premiere elite exhibition producer Arthemisia and Architect Corrado Anselmi the exhibition comes alive with interactive and participatory highlights that get visitors right into the middle of the mindset. Most successful is the clear and intuitive timeline used that includes Escher’s most famous mind-bending works such as Drawing Hands (1948); Metamorphosis II (1939-40), a woodcut that took 20 blocks to produce this miraculous mix of patterns and transitions across a span of over 12 ½ feet; the hauntingly precise Eye (1946); Relativity (1953), along with similar works represented here that have influenced many artists since, including the makers of the feature film Inception (2010); the mesmerizingly beautiful Three Worlds (1955); and perhaps his best known work Hand with Reflecting Sphere (1935), which is accompanied by an interactive installation where visitors can see themselves in the same composition. But don’t get me wrong, this noble effort and installation is not just Escher’s greatest hits. This exhibition is a fully realized; an all-inclusive retrospective featuring everything from his early stunners such as The Second Day of Creation (The Division of the Waters) (1925), where you can feel the cold conundrum of a violent sea being ravaged by rain; to Print Gallery (1956), where Escher himself could not solve the center of this twisting composition. There are preliminary sketches where he is working out his composition and the woodblocks themselves, where you can see just how, why and where he made his incredibly precise cuts. I could go on and on, but my best advice is not to miss this most important exhibition. We all need some time to get away from the day-to-day politics and general upheaval on all sides and get our sense of wonder back and this is the place. Escher: The Exhibition & Experience is located at Industry City, 34 34th Street, Building 6, Brooklyn, NY. On a sunny August day it’s a beautiful drive for some 18 Tennessee miles into the country from Nashville to get to Monthaven, a historic home in Hendersonville. Chances are that you’ll step on Johnny Cash Parkway at some point, the city’s main road. To the best of my knowledge, more recent residents of note, the likes of Kelly Clarkson and Taylor Swift don’t have parkways named after them as yet. The property saw some Civil War action, skirmishes at least, having just been built as the conflict erupted, and subsequently pressed into service as a field hospital. 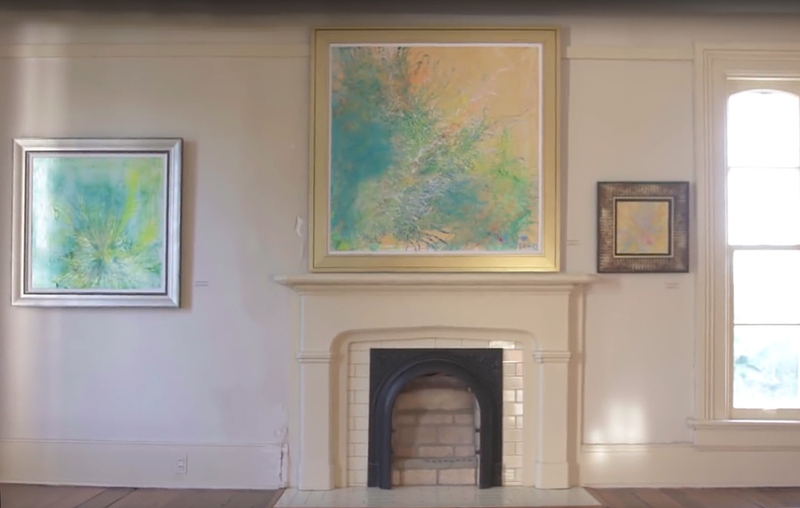 The building now houses galleries and the offices of the Hendersonville Arts Council, who’s stated mission it is to collect, preserve and interpret local and regional art, the facility presenting exhibits of regional, national and international importance. To spend solitary quiet time in the historic rooms of Monthaven and not sense the fleeting passage of a Civil War ghost or two is next to impossible. The blame for this may lay in the building’s bucolic setting. In the stillness, reminders of Monthaven’s history come in the whispers and creaks of its walls and floors. The arts center wrapped these qualities appropriately into their slogan: Where Art and History Will Bring You Back. “Autumn de Forest inspired me,” said Strichik. “I’m a 64 year old woman and she made me want to soar! She had that effect on all of us. Her art was crisp yet funky, sharp and soft, colorful yet gray. She put hearts on her paintings and painted rows of big poppy’s or so I called them! She painted cool American flags and paintings of sneakers. Who does this? Only someone like Autumn. When she left here all the kids could not quit talking about her. One girl from her class she gave here, portrayed Autumn at her school for their Wax Museum Day. She dressed like her and did pigtails and held a painting she had done of Barbie. She certainly was loved by our adult patrons also, as I have promised her return in 2019/20 so they can do a master class with her! I must say after Autumn left we were even more committed to obtaining the land around us to build our educational arts facility.” As an update, the land has been by now signed for and Monthaven is closer to their dream of a free standing arts building. De Forest’s approach to teaching is hands on. There is a sense of teacher and student working from the ground up. She draws from her working experience, sharing openly her own success and, more importantly, her signature way of imparting the enthusiasm born out of the pleasure of her own eureka moments. 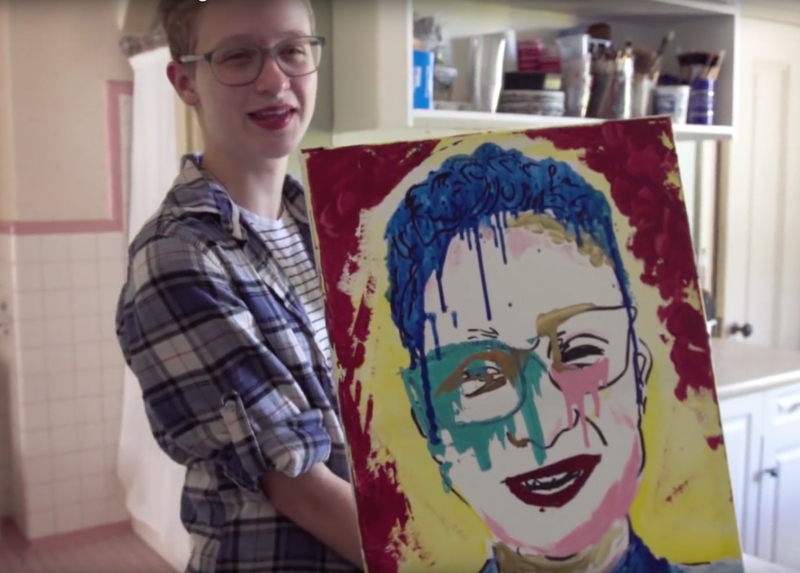 While the technique, or how-to aspect of the young artist’s teaching method may be the door-opener for a young student, there is also a budding philosophy behind it. De Forest states it this way, “I feel as though creating is honestly what makes the world interesting – what makes it not black and white, but rather beautiful and fantastic, and curious. I believe that art is what makes you see the world differently.” It is, perhaps, this open-eyed innocence that resonnates with her peers, standing in opposition to the worldly irony and cynicism that informs much of contemporary art. 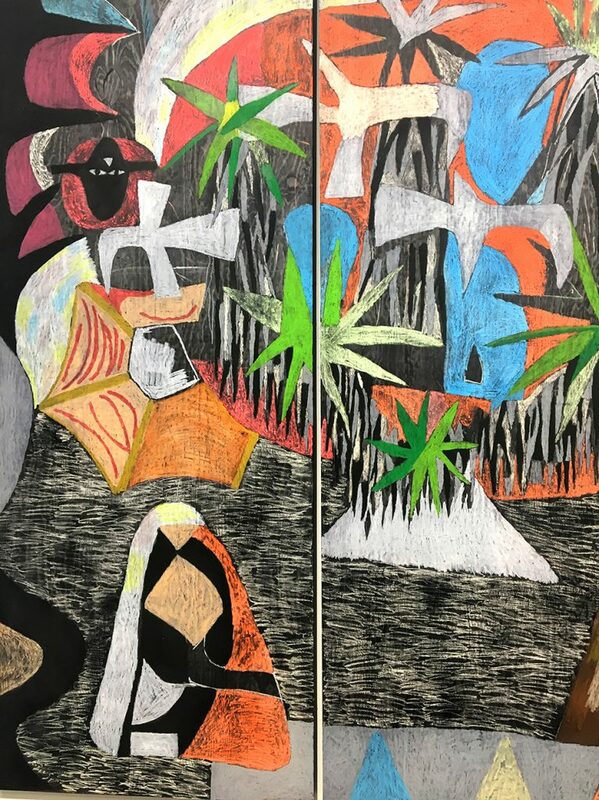 It’s worth keeping in mind that de Forest, having begun her art in earnest at the age of five, is in some respescts, already a ten-year artworld veteran, with gallery representation and numerous museum exhibitons padding her CV. At an auction in February 2010 de Forest sold over $100 000 in paintings within 16 minutes. She was only eight at the time. One of her paintings went for $25,000. 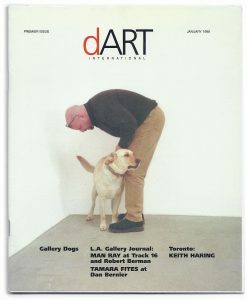 De Forest is represented by Park West Gallery, reportedly the largest privately-owned art gallery in the world, laying the claim to more than two million customers since 1969. Sponsorship for de Forest’s Monthaven exhibit was provided by the Park West Foundation. Established in 2006 by Albert and Mitsie Scaglione, it began by supporting youth that aged out of the foster care system in Southeastern Michigan. 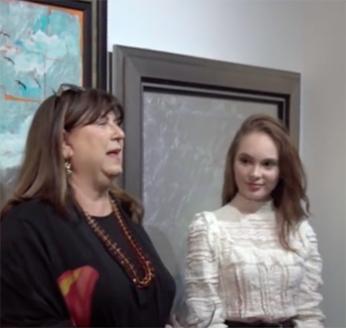 This past April Monthaven opened an exhibition featuring another Park West artist, Alexander Renoir, great-grandson of master impressionist artist Pierre Auguste Renoir. 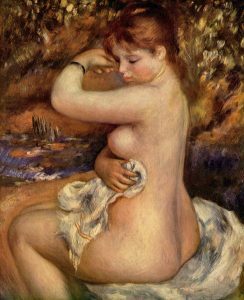 Beauty Remains, has on display 40 or so of Renoir’s works, primarily oils on canvas. Among those will be a painting Renoir has created specifically for the Tennessee exhibition entitled, Moonlight and Magnolias, depicting a view of historic Monthaven, the 1860s mansion built in the late Victorian Greek Revival style. 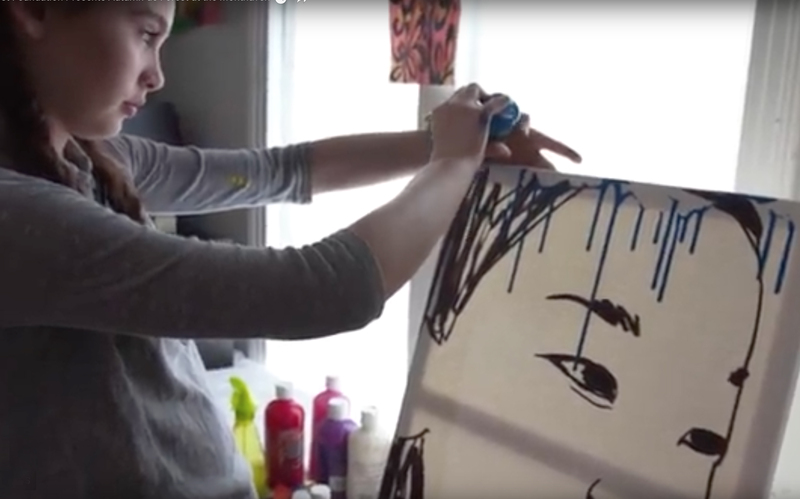 In June Monthaven Arts and Cultural Center opens a show with about 15 American veteran artists that have used art as a healing process from PTSD. Assistance for the vets was provided by a group called CREATIVETS who funded the vets’classes at the Chicago Art Institute. Herein lies the power of art to engage and integrate a person on multiple levels. As such, it gets to the root of creativity – to bring into existence something entirely new, something that didn’t exist before. That in itself has to be life-affirming. Photography newly reckoned as essence. Inquiry into absence spawns inscrutable presence. of canted canvases calls out staid art. Industrial to aesthetic, a structurology of production. an uncanny language of fabric. Through resin, gossamer layers gleam. A window into the glazed oblivion-house of America. Rhapsodic hue. Inner euphoria of nature and home. 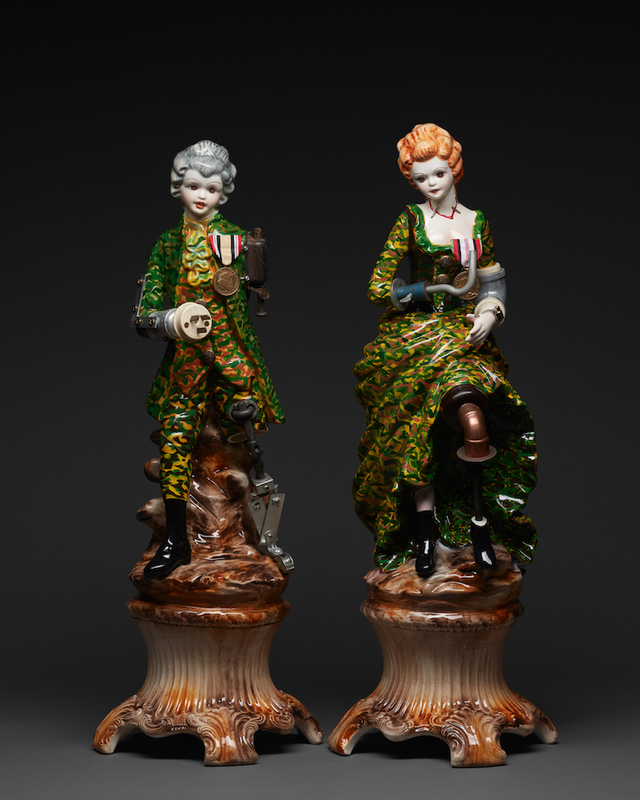 This exquisite little exhibition of recent, international, narrative sculptures demonstrates the technical virtuosity and wit of the five artists whose works are included. 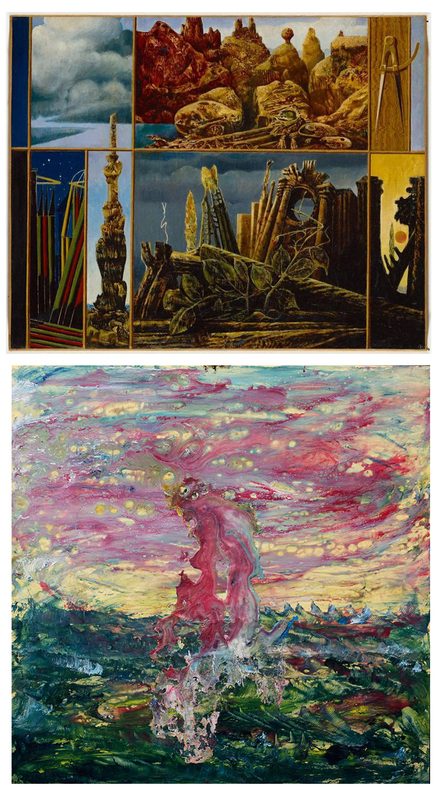 Four are figurative, one implies abstract landscapes. Directly ahead as one enters the gallery, on the far wall, Penny Byrne’s Operation Falconer and Operation Slipper face us side by side; both standing just over two feet high over their pedestals. They both look at us pertly, coquettishly wearing Victorian hairstyles and outfits, yet their garments are carefully painted in military camouflage patterns and they sport army boots in contrast to their coy countenances. However, each has a prosthetic leg and at least one arm replaced by a hook or, what looks like an electrical plug. They both wear heroic ribbons of valor: an obvious jab at the impropriety of social graces and gallantry disguising the ill gotten gains of their social classes. To the left is a bobble headed Donald T dressed up in stars and stripes like the spirit of ’76, while on the other side is a quintet of vintage Dutch porcelain figurines on a plate that look like they have chili peppers for scarves on. The gallery consists of two fairly small show rooms and an office area (I think there is a bit of storage space tucked away somewhere too). The largest sculptures on display here are by Cathy Lewis. The are made from shards of white porcelain crockery. Two prepubescent figures, a girl and a boy, stand almost four feet tall; next to one another. Strange little curls emanate from their foreheads quizzically (which are actually teacup handles). They are extraordinarily well made and lifelike, formed in accurate simulacrum anatomically, except shattered, fragmented – like fragile elfin jigsaw effigies. 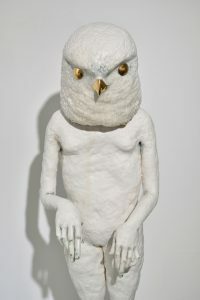 Kathy Stecko’s anthropomorphic figurines have weird doggy or rabbit heads on humanoid bodies with hunched shoulders and attenuated limbs and gobs of glazed color here and there hanging down from a shoulder through hips or pelvis; with oddly existential, vacantly petulant countenances and stances. Other otherworldly creepy aliens have strange ears or antennae. Some of this coterie of etherial, phantasmagorical characters are mounted back against the wall, while a few loiter about on their sinewy legs. Their presentation makes me think of pinned butterflies. The entire exhibition is full of strange pixie-like presences; nymphs and oddly magical creatures that may be winking at one another betwixt the viewers’ gazes, and who knows what they are up to after hours when the gallery’s door are shuttered. Claire Curneen’s work is completely strange. Ms. Gilbert, the curator, in my presence suddenly decapitated one figure of it’s owl head, revealing the face of a hominid of sorts lurking beneath. Another, matte black stoneware figure of Curneen’s creation has wide sloe eyes and a generally eerie Edvard Munchian face, or perhaps, it’s the artist’s friendly subconscious nemesis – yes, that is a contradictory and oxymoronic description – and that is precisely why this is such an intriguingly different and special exhibition of similar artworks from widely different cultures worldwide. It indicates how we are all similar way down in the recesses and catacombs of our psyches, and how unusual that our curator managed to assemble this group from such disparate origins that are pervaded by comparable tricky impish gnomes engaging in ironic, humorous, and spooky social commentary. Keun Woo Lee is our landscape artist. This work relates to the rest of the show mostly in terms of material rather than content, being artfully glazed nonfunctional ceramic. I mention “nonfunctional” because utilitarian functionality is brought up in the press release as the primary traditional use of these materials (kiln fired clay, basically), jugs, plates, cups, etcetera – but it is certainly a legitimate medium for fine art; as if anything imaginable isn’t. 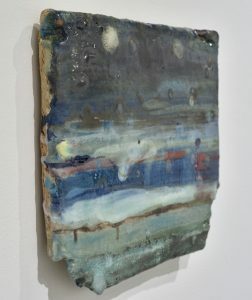 Lee’s works are small rectangular and square panels of subtly hued blurry horizontal stripes inherently implying landscape and atmosphere: granting an obscure environment for the characters in the rest of this show to inhabit. She also contributes a more abstracted three dimensional piece that might be an anthill type of a catacomb for when all of these spirits transmogrify and crawl in it together at night to get about whatever they do when human beings are not there to observe their activities – that is if any of them are even operating within mankind’s concept of inter dimensional time and space whatsoever. 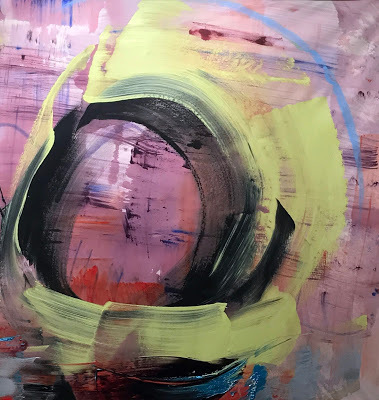 Francine Tint’s solo exhibition at Cavalier Galleries aptly titled Explorations consisted of twelve acrylic-on-canvas gestural abstractions ranging in size from an intimately scaled 25”x 25” to a whopping, in-your-face 52” x 210” work. 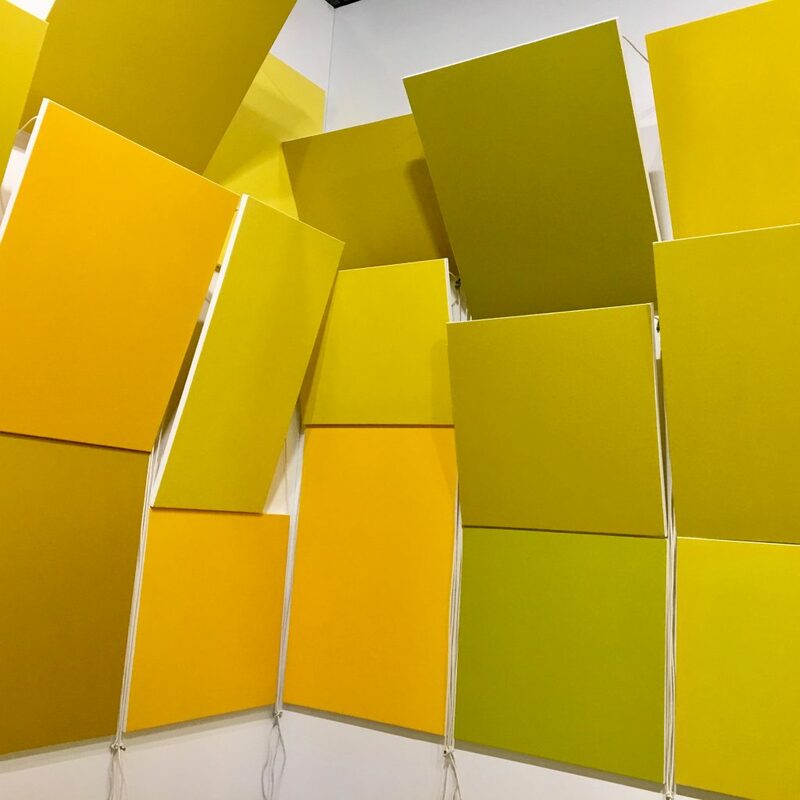 Most of the art in Explorations, with one exception, was done between 2017 and 2018 and this exhibition showcases Tint’s capabilities of poetic invocation to the hilt. 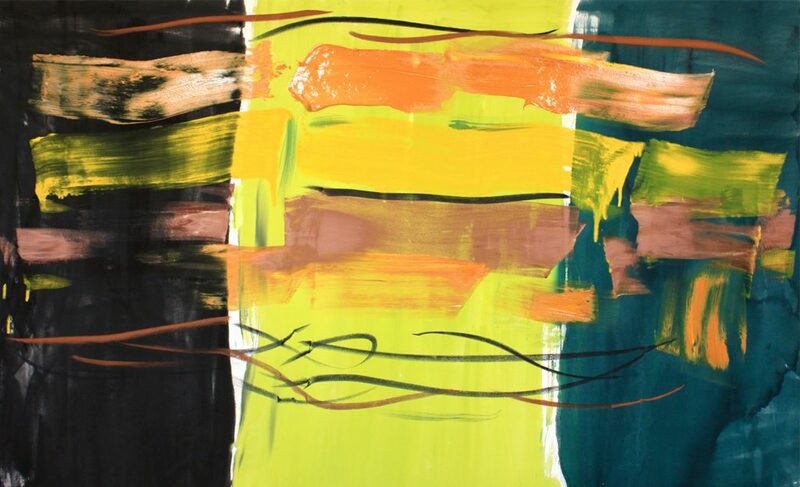 This artist is a senior member of the ab-ex boy’s-club movement and over the years has not relinquished her steady hold of gestural abstraction. Instead she has consistently re-invigorated expressionism with new energy and vitality, as this show demonstrates. There are numbers of surprises in the exhibition and they fall under several categories. One of them is how moodily poetic this artist’s work can be and how charged her visual poetry actually is through Tint’s exploratory surfeit use of a variety of material traces and a comprehensive array of different painterly marks wielded by the painter to suit various internal needs of expression. These gestural marks are generated from a spectrum, ranging from those that are relatively random, mechanical, self-effacing, or constructive to those that are provisionally expressive, eccentric, deliberate or flamboyant. What is more, Tint is apt to combine all these marks at once and sometimes her mark or marks purposefully vacillate equivocally between oppositional poles. A good example of this application of visually expressive polyphony and tonal multi-vocality is Tiger (2017). Here Tint’s dynamic spatial play, engendered by the loose geometry of the tri-partite ordering of the pictorial surface, is enhanced by a persuasive ambiguity. Long, dark sinuous horizontal lines seem to be embedded within languid, opulently levitating, interstitial, ribbon-like brush marks that seem to quaver between front, middle and background positions vis-à-vis the three upright-positioned rectangles. authenticity, of original facticity born out of ritual intent. Towards that purpose Francine Tint doesn’t merely make paintings, she makes entities and charges them with vitality. 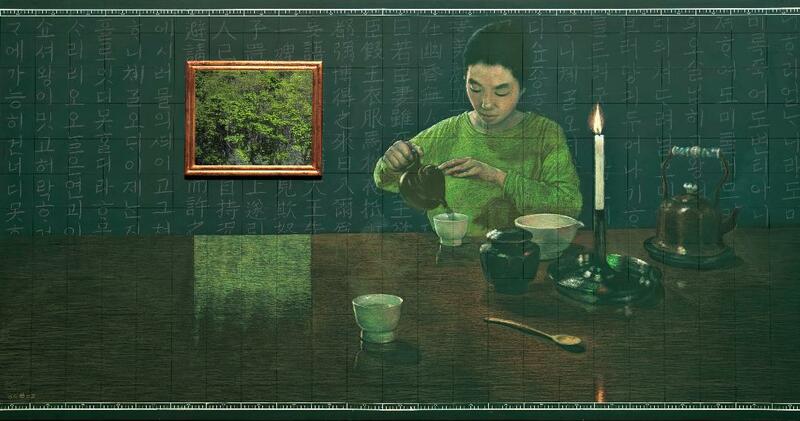 One is immediately attracted to her paintings from far away and from close-up observation. You see different things in her work from variable distances as much of her visual process is imbued with a strategy of accumulation. The additive quality of her canvases results in a growth and intensification of feeling through layering and collaging. 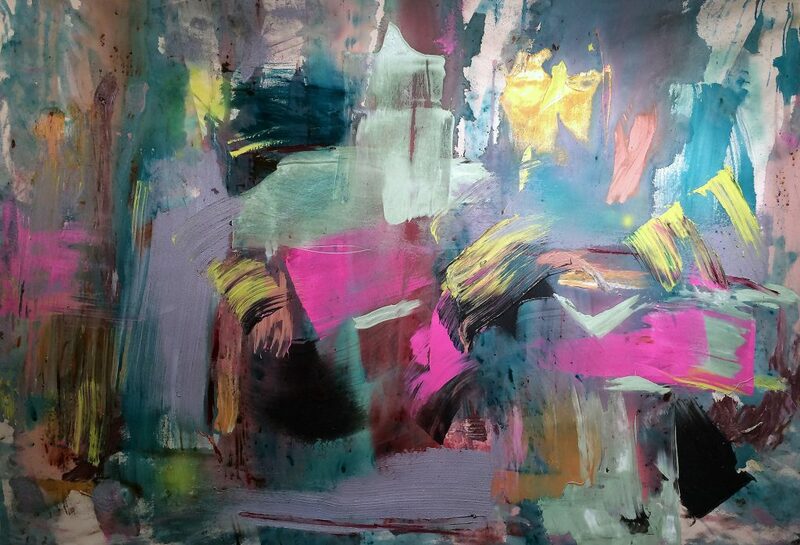 This working process is enhanced through Tint’s tendencies of working her colors and gestural strokes by layering of fields of colors, varying their lengths and girth and intensities. Such inventories of lines, marks and gestural strokes are a way of accruing physicality and depth. By getting in close to the weave of her canvases we see how the physicalizing is furthered by her adding of elements underneath the top layer surface of paint: the pearls in Blooms of Darkness (2018), the sand incorporated as texture in Sea Garden (2017), thick splays of paint extending over the edges of Wonky (2012). Explorations at Cavalier let’s us experience Francine Tint’s unique expressive abstractions for what they are: constituting the merging of the intuitive with the intentional, while setting the tone for compositions that are texturally rich, startlingly diverse and poetically resonant. Susan Schwalb is at once an artist of this world and a transcendent artist. Her drawings and paintings are abstract, decidedly manifestations of the world’s geometry; they echo the belief of Latin American modernist Joaquin Torres-Garcia that geometry provides the artistic and spiritual scaffolding for all true art, in all ages and cultures. Deploying minimalism in lyrical mode, Schwalb’s art is also allusive and suggestive – a contemporary reinvention of the Symbolism of the late 19th century. It extends with great virtuosity the potential of metalpoint to evoke a numinous effect through delicacy, fineness, and a shimmering luminousness. Take an attentive look at a work of hers and you will be transported. Upon graduating from Carnegie Mellon University, Schwalb devoted herself to an art career dominated by brush and watercolor and pen and ink till 1974, when, inspired by an artist friend, she began drawing in silverpoint. 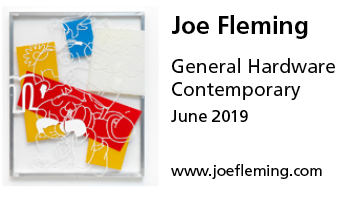 Exploration of other metalpoints followed and, since 1975, she has worked mostly in metalpoint, pushing the medium in recent years to move it towards painting. In personal conversation with me, she has said she was looking for a fine line when she found silverpoint a revelation. Schwalb prefers to discuss her art technically, eschewing metaphysical and speculative thinking. Yet she feels that a spiritual force drives her work. Metalpoint, especially silverpoint, took off in the world of European art when, in the 15th century, artists in Italy and northern Europe took a medium used for writing in ancient Rome and, in medieval times, for ruling and underwriting in illuminated manuscripts, and transformed it into an artistic instrument carrying a huge cultural charge. It enabled the creation of naturalistic effects, such as depicting surface textures, capturing the fall of light on objects, especially human skin and drapery, conjuring the illusion of three-dimensionality on a flat surface, and the suggesting of human emotions – the last-mentioned having the by-product of intensifying spiritual devotion. Renaissance artists utilized metalpoint to launch an artistic revolution, as Martin Gayford says in a review interpreting the show in the British Museum and the National Gallery of Art. Its revolutionary impact realized, metalpoint usage fell away in Italy after Raphael’s death in 1520. Almost the same decline occurred in the Northern countries, though there the medium survived through intermittent usage till the end of the seventeenth century. Then during the 18th century, only miniature portraitists employed metalpoint. For the medium once again to become an important propellant of artistic creativity, we have to wait for the nineteenth century. The impress of this revitalization crossed the Atlantic as well and, soon after the century’s turn, leadership in metalpoint drawing became a North American phenomenon. Metalpoint usage pushed American draftsmanship onto a high ground of technical achievement and propelled that usage in new directions. Yet, possibly because American art did not break through into geometric abstraction till the late 1950s, American metalpoint exponents of the early modernist period – artists such as Thomas Dewing, Joseph Stella, Marsden Hartley, Ivan Albright, and John Wilde – produced superbly crafted metalpoint art that was innovative and experimental but not radically so. It is only in the 1970s and thereafter that a greater transformation occurred, not only in the U.S., but in Europe as well. Referencing contemporary artists in both regions, Bruce Weber says that metalpoint is being used these days by a large and growing number of artists “in ways [the old masters] could never have contemplated or imagined.” Whether this amounts to a full-fledged metalpoint renaissance cannot yet be known, but something significant is going on. A Facebook group focusing on silverpoint/metalpoint drawing has attracted well over 600 members. 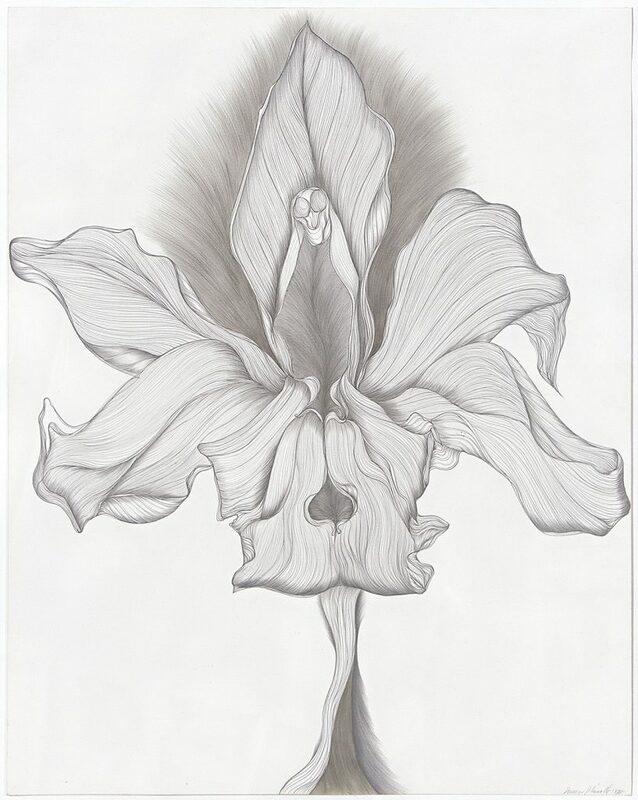 Schwalb began her metalpoint career making drawings of orchids, a motif carrying for her deep personal resonances. When you gaze at her Orchid Transformation #2, which she drew in 1978, you will be struck by the flower’s beauty and nearly muscular power and vibrancy, and as you keep looking, you will feel that it is not just alive, as if it were an actual organism – it is also a symbol for life or rather the way in which life embodies stillness amid rhythm and vitality. Close to Georgia O’Keefe’s flower paintings. Schwalb’s orchids are both naturalistic and abstract. 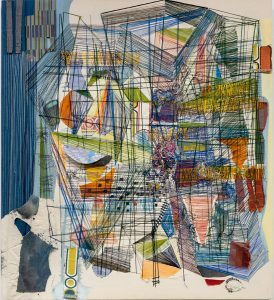 Schwalb became more radical in the mid-1980s, when she made drawings that were geometrically abstract or nearly so, transmuting memories of landscapes she had seen. Ideas originating in the world of music contributed to the metamorphosis together with influences drawn from Rothko and other Abstract Expressionists – all gradually morphing in the 21st century into an even more minimalist aesthetic that dominates her artistic practice today. For an early example of this aesthetic, let’s look at Madrigal #14, which Schwalb made in 2010. Bands and lines drawn in shades of dark grey with a bronze wool pad and a silverpoint stylus intersect horizontally a Plike-paper ground colored in a rich Venetian red. The bands and lines change their tones with exquisite subtlety. And the counterpointing tonality between them and the red background transports you into intense visual pleasure. Schwalb sees in her drawing an incarnation of a madrigal, a musical form that in the Renaissance served as a platform for poetic expressiveness. She makes you think of Matisse saying in A Painter’s Notes, “When I have found the relationship of all the tones the result must be a living harmony of all the tones, a harmony not unlike that of a musical composition.” In Madrigal #14 two voices interplay in a harmonious process that seems an endless becoming. This is art embodying allusion, implication, suggestiveness. A drawing Schwalb made in 2012, Madrigal #41, applying a copperpoint stylus and a bronze wool pad to white Plike paper, signifies a deeper move into a meditative minimalism. The three empty bands in the middle of the image seem to imply an immanent presence and make you think of Whistler’s Nocturnes, particularly his Nocturne in Blue and Silver – Chelsea. These paintings “relied almost entirely for their effect upon the contrast between two principal colors and their variations”, as art historian Peter Vergo says in his book The Music of Painting. 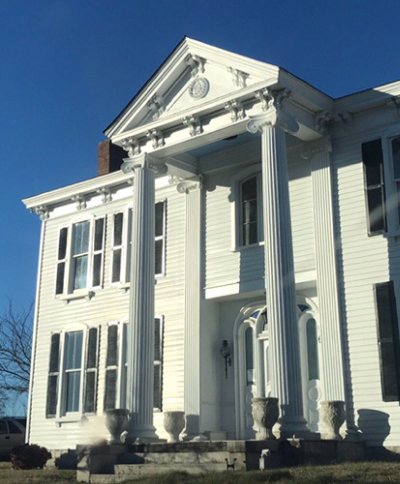 Schwalb employs white and gray to similar effect. But, building upon the modernism that bridges the century between her and her late nineteenth century predecessor, she goes further in making nearly invisible her subject matter. Her empty bands are allusively liminal in a symbolic way. Many art critic contemporaries of Whistler attacked his vaguely abstract paintings, their subjects veiled in colors inspired by Japanese woodblock prints, as lacking in substance and representing nothing. Today we find affecting the stillness and mysterious emptiness they allude to. Magnify this stillness and mystery and you will get an inkling of the numinous effect Schwalb achieves. Let’s now go to another work of Schwalb’s, this time a painting, Polyphony XIII, which she made in 2016. Using copper, silver and goldpoint together with black gesso on Museum Mount Board attached to a wood base, she interweaves a composition of squares, a banded cross, and finely spaced gray-brown horizontal strata that are faintly mauve, especially in the middle of the image. 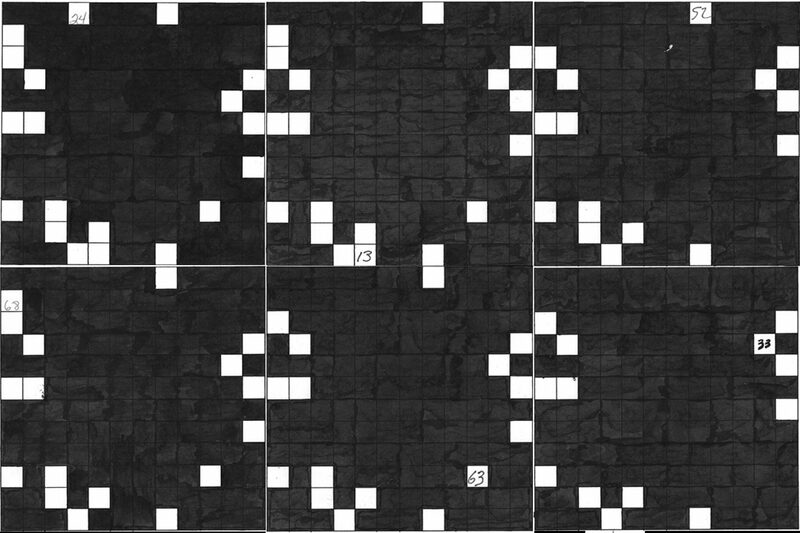 Subtle tonal variations move some squares to the painting’s surface while others recede, creating a dynamic spatial counterpoint on an otherwise flat surface. The longer you look the more the changes in tonal variation; the more – or less – the mauve you see, and the more the interplay among the squares. And when you vary the distance between you and the painting everything changes again, especially the tones. 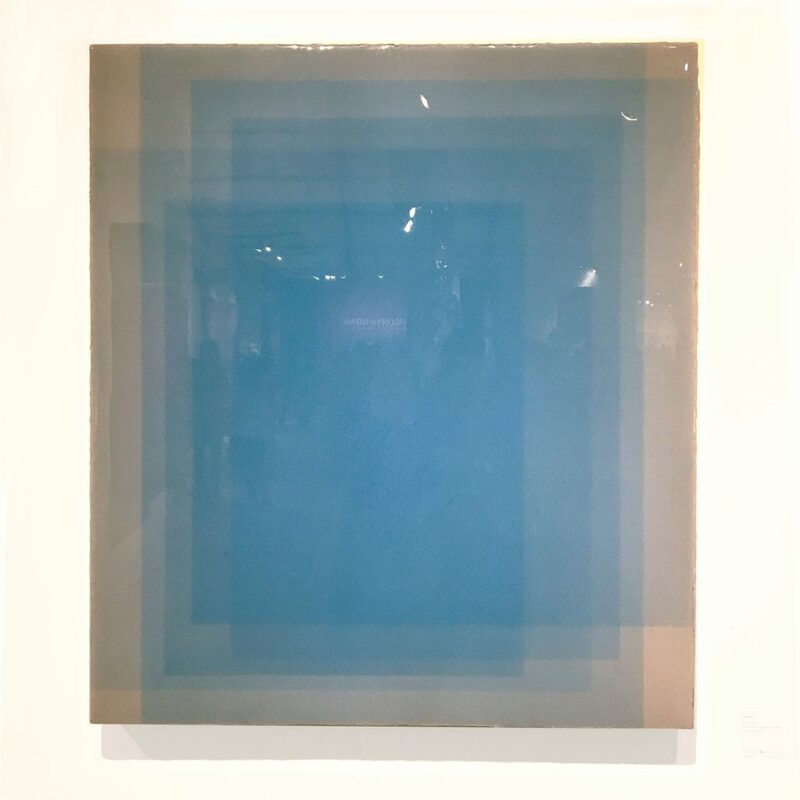 Schwalb is echoing here Joseph Albers’s magnificent achievement in his great series of paintings embodying his Homage to the Square. 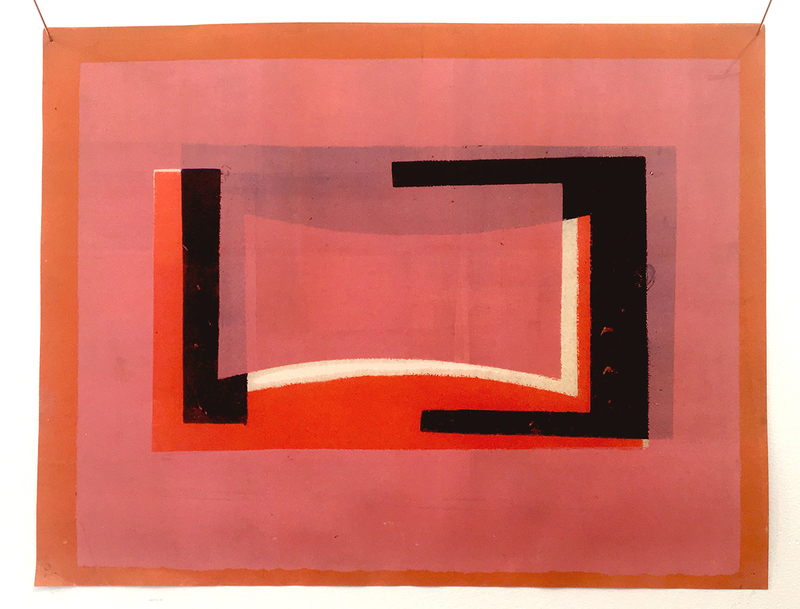 Like Albers, Schwalb has made a painting that liberates light from within. 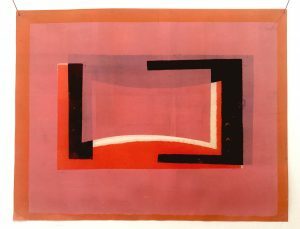 Curator Heinz Liesbrock says of Albers: “…color became the medium for him that could allow the complexity, indeed unfathomability, of reality to be experienced pictorially…” Enhancing the possibilities of metalpoint through skillful artistry, she achieves something similar, offering the beholder a profound experience of reality’s slipperiness. Hugh Moss, art dealer, expert in Chinese art, and a painter and calligrapher, has argued that modernism’s great contribution to art was to show that art is not just the art object but a more inclusive process that embraces the act of creation, the thing created, as well as the interaction that takes place between the art object and the viewer. Whereas a focus on the art object may have sufficed prior to modernism, the impact of modernist art depends crucially on the attentiveness the viewer brings to the art object. My feeling is that Moss is saying something important though he may have attributed to the break between modernist art and pre-modernist art too complete a rupture. Surely, pre-modernist art also demanded attentiveness. Surely, there was between it and modernist art no break but a hinge. Another way of looking at Moss’s position is to recall what Philip Glass said about an insight he received from John Cage. Glass wrote in his memoir Words Without Music, “I got to know Cage in New York. Even before I met him I knew his writings on music. 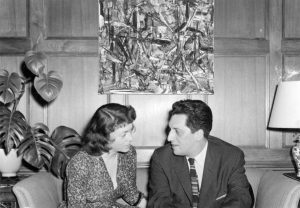 He brought ideas from Duchamp and Dada and surrealism – that music didn’t have an independent existence. It was a form of communication between the performers and composer and the audience. It totally reshaped the role of the listener.” In essence, the music comes into being when the listener completes the work. Putting Moss and Cage and Glass together, we could say it is the viewer who completes the work of art through attentiveness. We might also think of a great insight of Jed Perl’s that he set out thus in his essay The Art of Seeing: “Artists have to find ways to find ways to pull the audience in, for only when people come to understand that within a painting or a sculpture they can find a time that is outside of time will they want to keep looking.” Schwalb’s art snares you in this way. She does this not just through her virtuoso artistry; she does it too through the disciplined industry she brings to her process. For her grounds, she goes back and forth between commercially prepared papers and grounds she prepares herself. In the latter case, while she has utilized other materials before, she currently uses acrylic grounds in white or black or colored Holbein gesso. She says that while she uses graphite and colored pencils to accentuate some of her drawings, “metalpoint is the only tool that permits me to draw with great precision and exactitude.” She is guided by her materials’ suggestions but also enhances their vitality through such strategies as incorporating metal leaf, using paint to color her grounds, and then exposing underlying paint. Of the contemporary metalpoint revival, which she also highlights in her 2013 book, Thea Burns says it has “attracted artists who enjoy process and careful mark-making, and value precise refined draftsmanship and the technique’s exacting, labor-intensive yet quiet and meditative discipline.” These are the very hallmarks of Schwalb’s practice, and it is perhaps not surprising that she is seen today as metalpoint’s Pied Piper. Along with other artists, she is administering the previously noted over 600 member strong Facebook group. Metalpoint’s spreading use is indicative of something important. It is responding to a burgeoning need that surely includes, in an age when the growing ubiquity of Artificial Intelligence even includes its application to the arts, the showing of the artist’s hand as “an affirmation of human presence” (Burns).